Extensive coral bleaching reported in Singapore's Sisters' Island Marine Park. Dive trails closed temporarily from June 2016 to prevent further undesirable impacts on Singapore coral reefs. Among the corals likely to be affected are those that were rescued from island conversion to make way for Singapore's waste disposal. Singapore, 22 August 2016. Leisure scuba divers in Singapore have to head elsewhere to bask in colourful corals as Singapore coral reefs is experiencing massive coral bleaching. A news report by Today stated that coral bleaching is the reason for the closure of the Sisters' Island dive trails. Dive trails are likely to resume for public access in October 2016. Coral bleaching has intensified in many parts of the world, including Singapore. Coral bleaching has intensified in many parts of the world, including Singapore.Singapore, like the rest of the world, has become warmer as a result of the El Nino phenomenon that made its presence felt from 2015. NParks provided a conservative estimate of the coral bleaching threshold - a range between 30.95C and 31.35C - where it would be a struggle for corals to survive. Temperatures of sea surfaces in Southern Singapore have increased beyond the bleaching threshold sometime in May, it reported. NParks continues to monitor coral health throughout this period. It believes that shutting the dive trails temporarily will minimise human impacts on the stressed corals. NParks has also initiated a survey in June 2016 to study the corals closely to investigate if human intervention is needed to save certain coral species. This can be done by moving rare local species, for instance, into deeper waters or more controlled environments. Coral colonies in the Sisters' Island Marine Park include those that have been relocated from Pulau Semakau in January 2015. The National Environment Agency reported then that over 700 coral colonies were moved, equivalent to about 60 square metres of live coral cover, from Semakau Landfill’s lagoon to the Sisters’ Islands Marine Park. The relocation of corals had to be done as the authorities made way for a new landfill cell to fulfil Singapore's waste disposal needs up to 2035 or beyond. In 1998 and 2010, Singapore experienced mass coral bleaching as well attributed to the El Nino effect. Experts have predicted that coral bleaching will intensify over the years and called for greater governmental action on conservation. By 2050, all reefs in the region are projected to be threatened, with more than 90 percent in the high, very high, or critical categories. Davao City, 1 July 2014. Off the Davao coast, Kopiat Island boasts of clear and calm waters and wide sections of shoreline blanketed with fine white sand. It is a tranquil place that hosts unspoiled reefs with rare coral beds. Just 200 meters away from the island’s shoreline, snorkelers can get close to the various species of colorful corals, both hard and soft. However, you can already get a glimpse of the beautiful corals just by looking down into the water from the boat. “We are trying to protect these coral reefs from people who want to harvest them for aesthetic purposes in their homes,” says Christine T. Dompor, the provincial tourism officer of Compostela Valley. “Although coral reefs have always been subject to natural disturbances – disease, predator outbreaks, and climatic disruptions such as hurricanes and the El Niño – natural damage is now being compounded by human-induced disturbances,” noted Coral Reefs: Valuable but Vulnerable, a discussion paper circulated by the World Wide Fund for Nature (WWF). Unlike hard corals, soft corals do not have a calcareous skeleton. But like hard corals, they are vulnerable to ocean acidification. There are three major types of coral reefs, according to Dr. Angel C. Alcala, former head of the Department of Environment and Natural Resources. These are fringing type (those found on the edges of islands and which constitutes 30% of the country’s coral reefs); the barrier type (best exemplified by the Dajanon Reef of Central Visayas); and the atoll (of which the Tubbataha and Cagayan Reef in the Sulu Sea are ideal examples). Unknowingly, corals are the dried and bleached skeletons of soft-bodied animals that live in the warm, sunlit waters of tropical seas and look more like plants and rocks than animals. The main part of the real coral is the polyp – the extraordinary flower-like animal with a tube-like body and finger-like tentacles. “Coral polyps get nutrition in two ways,” explains Lindsay Bennett, author of globetrotter island guide, Philippines. 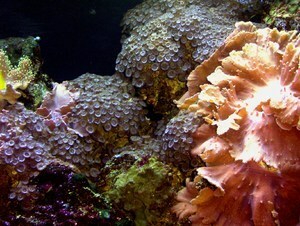 Symbiotic zoozanthellae algae living in the tissues of coral polyps give corals their colour. Coral bleaching occurs when corals lose this colour, turning white. Coral polyps reproduce in two ways: asexually (by the division of existing individual polyps) and asexually (by combining egg and sperm from two different polyps). “This results in a free-swimming polyp that will be carried by ocean currents to find a new colony and commence a new reef,” Bennet writes. The coral reef is the world’s most diverse marine ecosystem, and one of its most productive. It is home to some 4,000 species of fish (approximately one-quarter of all marine fish species), along with a vast array of other life forms – molluscs, crustaceans, sea urchins, starfish, sponges, tube-worms and many more. Most of these coral reefs are teeming in the waters of the Coral Triangle, which is recognized as the global center of marine biological diversity. The area within the ecological boundary of the Coral Triangle contains nearly 73,000 square kilometers of coral reefs – that’s 29 percent of the global total – and spans parts of six countries: Indonesia, Malaysia, Papua New Guinea, the Philippines, Solomon Islands, and Timor-Leste. “There are perhaps one million species in a habitat that covers a total of about 250,000 square kilometers (roughly the area of the United Kingdom),” reports Reefs at Risk Revisited in the Coral Triangle, a publication published by the Washington-based World Resources Institute (WRI). Dynamic and highly productive, coral reefs are not only a critical habitat for numerous species, but also provide essential ecosystem services upon which millions of people depend. More than 275 million people globally live very close to reefs. In the Philippines, for instance, more than 40 million people live on the coast within 30 kilometers of coral reef, which represents about 45 percent of the country’s population. Approximately, two million people depend on fisheries for employment, with about one million small-scale fishermen directly dependent on reef fisheries. The country’s reefs yield 5 to 37 tons of fish per square kilometer, making them very important to the productivity of fisheries. Coral reefs, like mangroves, play a major role in protecting tropical shorelines from the erosive powers of storms and wave action. Under normal conditions, they act as self-repairing, natural breakwaters, which is particularly vital on coastlines that are subject to cyclones and hurricanes. In terms of net economic benefits of shoreline protection from reefs, Philippines leads with US$400 million while Indonesia came second with US$387 million. “These values are likely much higher today due to increased development, and hence increased numbers of coastal properties at risk,” the WRI report said. The prospect of finding a new drug in the sea, especially among coral reef species, may be 300 to 400 times more likely than isolating one from a terrestrial ecosystem. “Marine sources could be the major source of drugs for the next decade,” says Dr. William Fenical, a natural products chemist at the Scripps Institution of Oceanography in La Jolla, California. But the future for coral reefs is grim. Rising levels of carbon dioxide and other greenhouse gases in the atmosphere will further threaten reefs, as warming prompts coral bleaching and more acidic water slows coral growth. The WRI report said that by 2030, almost all reefs in the region are projected to be threatened, with 80 percent in the high, very high, or critical categories. By 2050, all reefs in the region are projected to be threatened, with more than 90 percent in the high, very high, or critical categories. Turtle conservation efforts, especially endangered turtle species, in the Philippines. Unless the governments and the people of the Coral Triangle Region will work together, their ecologically-fragile coral reefs may vanish without a trace. Diving opens up a whole new underwater world of natures marvels – but it also reveals the damage humans do. Attending a Biorock Reef Gardening Course offers a great way to help keep reefs healthy and prospering. A look at threats to Philippine fishery and causes incorporating marine habitats, ocean fishing, mangrove and seagrass. Because NGOs are private, they face many problems that private business encounter – but without a profit to keep them going. After six years of creating new coral reefs, the folks in Gili Trawangan are ready for more. In November this year, more structures will be built and laid down underwater following a workshop built in with hands-on training. The 7th Indonesian Biorock reef restoration and shore protection training workshop 15-21 November 2010 is organised by The Gili Eco Trust and the Global Coral Reef Alliance. Read about it as well as the Gili Trawangan reef restoration story here.